UNITED NATIONS, February 13 -- The UN Secretariat has for more than two weeks told Inner City Press that the selection as "Senior Adviser on Peacekeeping Operations" of Shavendra Silva, whose Division 58 is repeatedly named in connection with war crimes in Secretary General Ban Ki-moon's Panel of Experts report on Sri Lanka, was entirely up to member states. Ban told Inner City Press this himself. After Inner City Press reported this, Sri Lanka's Mission to the UN wrote a letter of complaint to Inner City Press, sending a copy to Ban's spokesman. Inner City Press has published and responded to the letter, citing only some of the many references to Silva's Division 58 in the report. 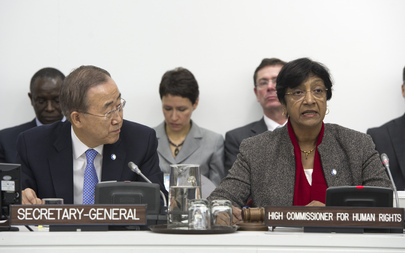 On Monday outside a General Assembly session on Syria, Inner City Press asked UN High Commission on Human Rights Navi Pillay about the case, and if she thought it reflected well on the UN. Pillay responded, on camera and on the record, that "It's a matter of concern... my office keeps a list of individuals suspected of committing human rights violations." She added, "I have addressed a letter of concern to the Secretary General about this." This was the last question in Pillay's UN TV stakeout. Afterward, Inner City Press asked Pillay for copy of the letter. She said it could not be provided. But she said what she said. Watch this site.